Two members of a cult in China have been executed for murdering a woman in a McDonald's restaurant in Shandong, according to a local court. Zhang Lidong and his daughter Zhang Fan were members of the banned Church of the Almighty God cult. They were part of a group who attempted to recruit the 35-year-old victim, Wu Shuoyan, in the restaurant in the town of Zhaoyuan in May 2014. When she refused to give her phone number, they beat her to death. The Shandong Yantai Intermediate People's Court announced the Zhangs' execution on its Weibo account (in Chinese) on Monday morning, noting that the father and daughter had "committed murder and used a cult to intentionally break the law". The group was found guilty in October last year. Three others were give jail sentences ranging from seven years to life imprisonment. The court's statement said that Zhang Fan had asked Ms Wu for her contact details twice. When the victim refused, the group believed that she was "possessed by an evil spirit", and Zhang Fan threw a chair at her. The rest of the group joined in the attack and beat her with mops brought by Zhang Lidong, who also stamped on Ms Wu's head and face. She died at the scene from her injuries. Zhang Lidong said in an interview later that he believed Ms Wu was a demon and that "we had to destroy her". 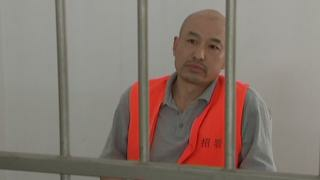 Since the killing, which sparked public outrage, the Chinese authorities have detained hundreds of members of the cult. The cult's core belief is that God has returned to earth as a Chinese woman to wreak the apocalypse. The only person who claims direct contact with this god is a former physics teacher, Zhao Weishan, who founded the cult 25 years ago and has since fled to the United States. It claims on its website that it has millions of followers and says nearly 400,000 have been arrested between 2011 and 2014.